Eggs baked with grated pecorino Romano and topped with shaved black truffles. 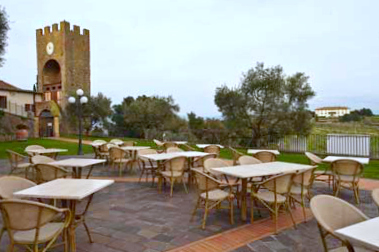 We happened upon this picturesque cantina in beautiful Artimino in the hills of Tuscany on our first day in Italy. We had just spent two hours on a harrowing ride around downtown Florence then along narrow winding country roads and up a mountain on a laughably hazardous (two-way!?) road in our rental Fiat. When we finally arrived in Artimino – a tiny town perched on a mountaintop overlooking the Tuscan hills – we were exhausted. The cantina was completely empty and were feeling almost too jet-lagged to eat, so I wasn’t expecting any culinary revelations. 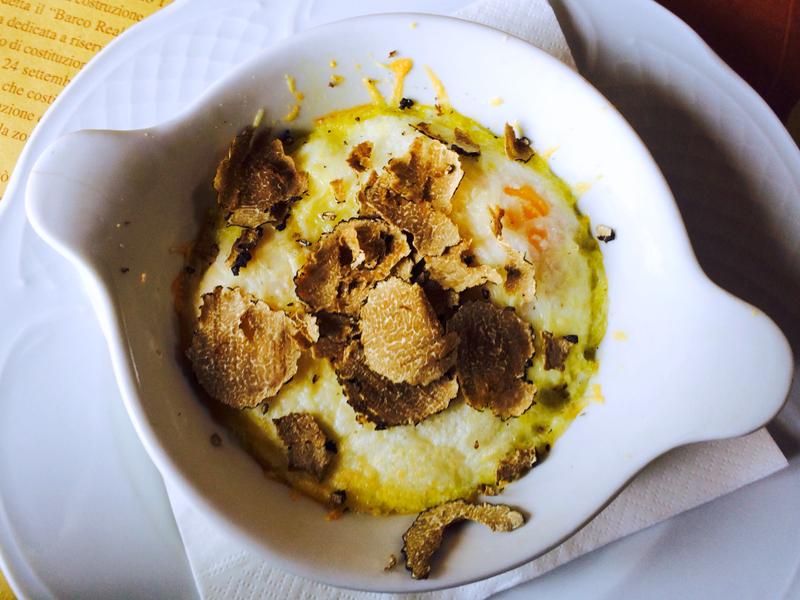 But when I saw baked eggs with pecorino and shaved truffles on the menu I did get excited. I had heard that white truffles were in season, and there is nothing like pecorino in Italy. My excitement was tempered slightly when the waiter told me they were using black truffles. And perhaps the dish would have been even more delicious – not to mention significantly more expensive – with white truffles. But while truffle oil has become ubiquitous in nearly every even slightly upscale restaurant across North America, it’s not every day that I eat shaved truffles of any variety. The dish was simple and exquisite. I don’t think there was anything more in it than the three ingredients in the title, but between the pecorino and the truffles this dish had a depth of flavour that isn’t found in most dishes containing ten times the number of ingredients. I completely agree! I love dishes that contain few ingredients – something Italians seem to excel at. As for the truffles, as luck would have it we were in a small Tuscan town during a white truffle festival, so I was able to do some taste-testing. Yummy!! I did try making this dish yesterday but it didn’t quite work out as planned. I baked the eggs at 400 in my convection oven for 12 minutes and they came out tasting like they had been microwaved! :-p Going to give it another go next week. I love the simplicity and uniqueness of the dish. I am closing my eyes right now and imaging the dish and trying to taste the flavours. virtually. It does taste excellent. The scenery is great too. Now you make me want to speed up my desire to go to Italy…thanks for sharing your experience. Thanks. The simplicity is really what was so great about it. When there are truffles involved, there is really no need to add much else! What I love most about food in Italy is how they tend to focus on whatever is in season locally and showcase those ingredients. It is certainly a place of simple but delicious foods. I hope I’ll be able to visit Italy, one day. Have a great week!